In February 2015, the University of Wolverhampton Faculty of Science and Engineering opened the doors to its new, state-of-the-art science centre. Now known as the Rosalind Franklin building, the science centre was designed without any traditional teaching spaces such as classrooms or lecture theatres, no “front of the class” teachers desk, lectern or projectors. This demonstrated a commitment to a radical change in pedagogy by the Faculty. The traditional approach to practical science had been live demonstrations given by academic staff to a group of students huddled around a bench at the front of the laboratory. The students would then carry out the same experiment immediately afterwards. For courses with large cohorts of students, this meant that any demonstrations would need to be repeated by the academic several times each year. This put a strain on academic workload, resources and room allocation. It represented a duplication of effort and could potentially result in inconsistencies in information delivery should the workload be shared between two or more academics. From the student perspective, it gave very little opportunity for them to contextualise or reflect on what had been demonstrated before carrying out the experiment themselves. The time to undertake additional research or reading to support them in the practical session if necessary. Historically, practices for the production of video materials had generally involved traditional filming and editing techniques. This process produces high-quality results but is time consuming and requires specialist skills. The faculty estimated that they would need 200 hours of video per semester in order support the teaching in the new building, which would be unachievable with traditional methods. They needed to streamline the video production process and lecture capture technology provided a solution. 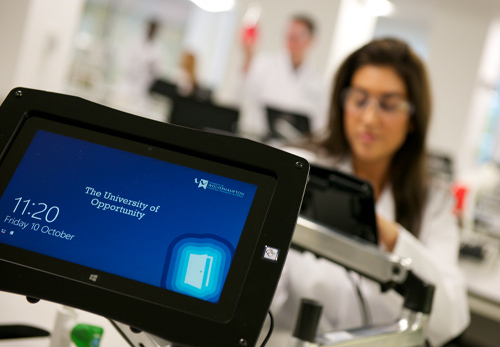 The University of Wolverhampton had already been experimenting with lecture capture for a couple of years. The response to the experiment from students and staff had been overwhelmingly positive, but the approach to supporting the technology was ad-hoc. It relied heavily on the availability of a technician to transport mobile capture equipment, set-up, record, upload, edit and distribute recordings and this wasn’t sustainable on a larger scale. The science centre provided an opportunity to re-evaluate the support models for lecture capture and think about what sustainable support of this type of system might look like for the wider university. A project team was formed consisting of colleagues from the Directorate of Academic Support (including IT Services, Library and Information Services and the Centre for Technology Enhanced Learning) and the Faculty of Science and Engineering, to deliver a one-year lecture capture pilot focusing specifically on the suitability of lecture capture technologies for supporting the learning and teaching of science subjects in the Rosalind Franklin building. The project team worked with the faculty to develop a specification for a lecture capture system with procurement taking place in summer 2014. The tender was won by Panopto and we then began working with their team to get the project up and running. Three dedicated lecture capture recording spaces were designed and installed in the new building, taking into account the discipline-specific requirements of capturing detailed demonstrations of scientific experiments. The recording spaces consist of touch-screen interfaces that are fit for a laboratory environment, and a variety of flexible recording devices including movable ceiling-mounted cameras, high-definition webcams and document cameras. In the lead-up to the building becoming fully operational in February 2015, fifty academics from the faculty were trained to use the lecture capture system to support their academic practice. The recording spaces in the science centre are now being booked by staff in the faculty, giving them the flexibility to record the video content they require by themselves without needing specialist skills, and to make their recordings available to students almost immediately. This was just the first step towards delivering our innovative approach to teaching and learning at the Rosalind Franklin building. The next steps were to start evaluating the impact of lecture recording on student learning and to support the emerging use cases for video that started to grow once we’d implemented Panopto’s lecture capture technology. The next stage of the University of Wolverhampton Science Centre’s journey with lecture capture will be coming up on the Panopto blog next week. In the meantime, if you want to find out more about how Panopto can support new pedagogical approaches at your institution, you can request a demo from our team or take a 30-day free trial.